Sophomore Morgan Cheek tallied a career-high nine goals to lead the Crimson to an upset of No. 2/2 Brown and clinch a spot in the Ivy Tournament Final. Late in the third quarter of a tied game against Brown, the No. 2/2 team in the nation, sophomore Morgan Cheek found himself being double-teamed by two Preseason All-Americans. Having played the game of his life up to that point, however, Cheek did not mind. He split the two defenders, blew by another, and faked the goalie before finally slotting the ball into the back of the net. It was his sixth goal of the night. More importantly, the scoreboard read 9-8. Harvard had taken its first lead of the game. With more than a quarter remaining, Cheek wasn’t done. He added three more to finish with a total of nine, in the process tying the all-time Crimson record for most goals in a game and setting the Ivy League tournament record for the same statistic. On the shoulders of a career night from the sophomore attacker, Harvard (8-7, 3-3 Ivy) earned its most impressive win of the season by overcoming the Bears (14-2, 6-0) on their home turf in Providence, R.I. It needed every single one of Cheek’s goals to pull out the 13-12 victory, as Brown’s top-ranked scoring offense came close to sending the match into overtime with a barrage of shots late in the fourth quarter. By holding on for the win over the Bears, Harvard earned a berth in the Ivy League tournament final on Sunday against No. 7/6 Yale. If the Crimson can avenge a 9-8 regular season loss to the Bulldogs and come out on top, it will secure its first tournament championship in school history and earn an automatic berth into the NCAA tournament. Second-ranked Brown, meanwhile, finds itself out of the tourney despite running the table against conference opponents during the regular season, and outscoring them by an average of 9.5 goals. The Bears will likely still earn a bid to the NCAA tournament based on its performance over the course of the year. On Friday night, however, Harvard was the team that needed to win to keep its season alive, and it played with a sense of urgency to match the occasion. On a field with the Crimson’s largest senior class in recent memory, as well as the top attacking duo in the country in Brown’s Dylan Molloy and Kylor Bellistri, it was Cheek who shone brightest. Molloy, a junior, tallied five goals on the night to bring his season total to an NCAA-best 56, while Bellistri, a senior, added four and now has 55 for the year, good for second best in the nation. Cheek entered the matchup with 26 goals, just over half of what each of his Bears counterparts started the game with, but found a way to singlehandedly match their output. Cheek began by scoring the Crimson’s only goal of the first quarter, one that kept the team in the game as Brown came out of the gates fast to take a 3-1 lead. Harvard came back to tie the game in the second quarter, but the Bears finished the half strong to take an 8-5 lead into the intermission. Needing a big run to save its season, the Crimson responded by scoring five unanswered goals in the third quarter and turning the three-goal deficit into a two-goal advantage. 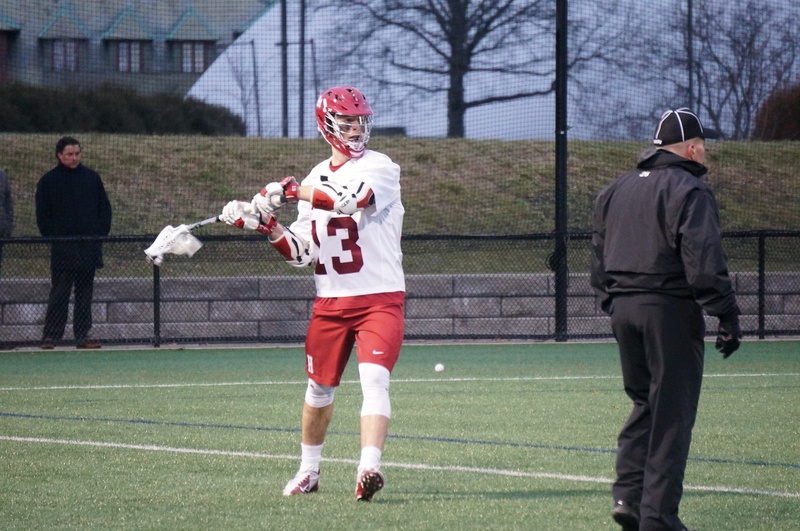 Crimson sophomore goalie Robert Shaw made several key saves in the third quarter to spur the run, and continued to make timely stops in the fourth. 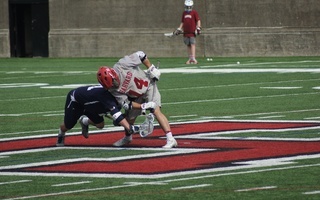 Freshman face-off specialist James Sullivan also played a big role in protecting his team’s lead. He held his own against Brown senior Will Gural, a first team All-Ivy selection last season, to hold the Bears’ momentum at several points in the final quarter. Though the Bears cut the lead to a single goal twice, Harvard ultimately held on to earn the victory. –Staff writer George Hu can be reached at yianshenhu@college.harvard.edu. The Crimson remains in the fourth spot and faces a daunting challenge against 1-seed Brown, which went undefeated in conference play this season. 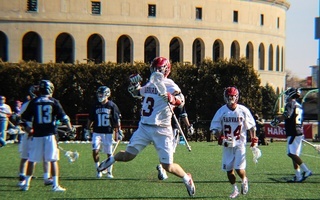 Harvard's Ivy League playoff hopes took a hit with a 14-10 home loss to Penn on Saturday.